The Milwaukee Black Saux were established in 1939 in Milwaukee, Wisconsin, with a nickname inspired by the old Sauk tribe in the Wisconsin area as well as the Black Hawk War of 1832. The club didnt fare well during World War II, as 7 of their starters and 13 other players in the organization were selected by the draft to serve in the war. The Black Saux searched for a team to merge with, much like Boston and New York two years later, but were unsuccessful. Instead, they were forced to suspend operations in 1942 until the war was over. In 1945, the team returned to the field, and a year later won their first USBL championship. The Black Saux won four titles until their shocking move to St. Louis, Missouri. The move was one of the wildest events in the history of all of sports, and some experts still are unsure of what caused the relocation. 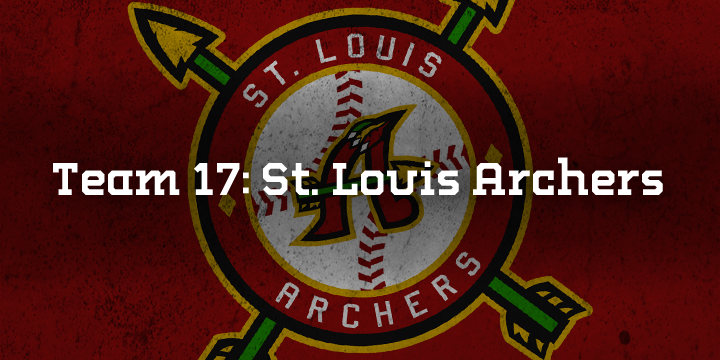 On December 27, 1962 just after midnight, the club packed up a caravan of trucks and made the 375 mile trip to St. Louis to become the Archers. For fans in the Show Me State, Christmas came two days late. But for the Black Saux fans, they felt betrayed by both their team and the league. A new stadium was being designed in Milwaukee, attendance was historically high, and the on-field scenario was nothing to complain about. The city is finally warming up to the idea of a new team, as theyre one of several finalists for 2016 expansion. As for St. Louis, a lot of conspiracies have been made about their relocation in the 60s; the most likely of which involves the Gateway Arch itself. Rumor has it that the owners of the Arch slid money under the table to the team, covering both the cost of relocation and a ballpark. In exchange, they named themselves the Archers, a nod to the Arch and still maintaining respect for Native American hunters. The Archers have five Branson Cups under their belt, but only one since moving out of Milwaukee, coming in 1968. Linwood Johnson hit a walkoff, three-run double to take the Championship Series in five games for St. Louis. That season, Bill Russell, Clifford Weaver, and Hunter Triplett each won 25 games, and all three were elected to the Hall of Fame. Today, the Archers are certainly one of the better teams in the USBL, as theyve made the postseason 6 times in the past 10 years. They are certainly built to make a run, even though they sit a couple games out of the playoff picture. 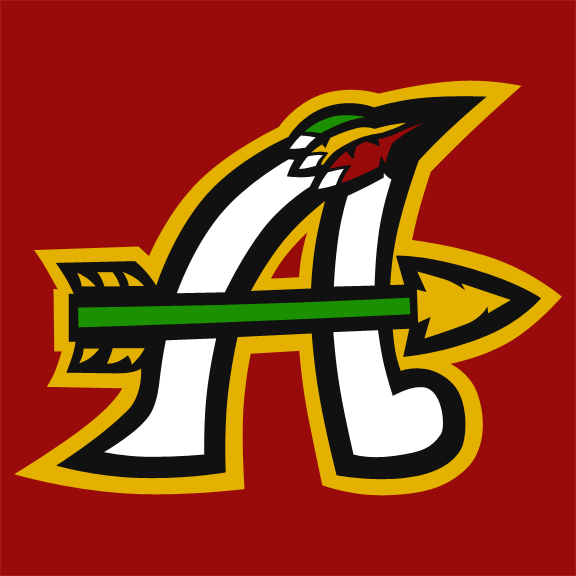 Led by Octavio Sandoval, easily the best centerfielder--and possibly even the best overall player--in the game, as well as Pedro Quezada at first, Riley Mann in left, and Eric Hughes closing games, the Archers expect to see themselves in contention. Their rotation hasnt been good, but they compensate for that with a dynamic offense, where they rank second in steals and third in homers. Its too early to count them out due to their recent track record in the late season, but without starting pitching, their run could be over before it begins. The St. Louis Archers have a unique identity from the logo standpoint--they have two primary logos that are used equally, as opposed to a primary and secondary. 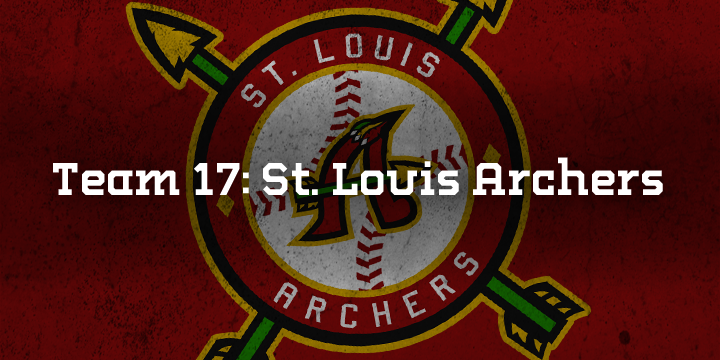 The arrow and feathers are immediately identified with St. Louis baseball, even more than the Tribe. While the basic concept has remained since the relocation, the Archers have gone through several subtle tweaks. In 2010, the scripts were updated to a more modern font, the numbers were altered from USBL Block to a thinner block, and strokes between logos, scripts, and numbers were unified. The A-Arrow is worn on the home caps, while the famous STL monogram decorates the road caps. As for the primary logos, the logo that is not worn on the cap is on the left jersey sleeve. 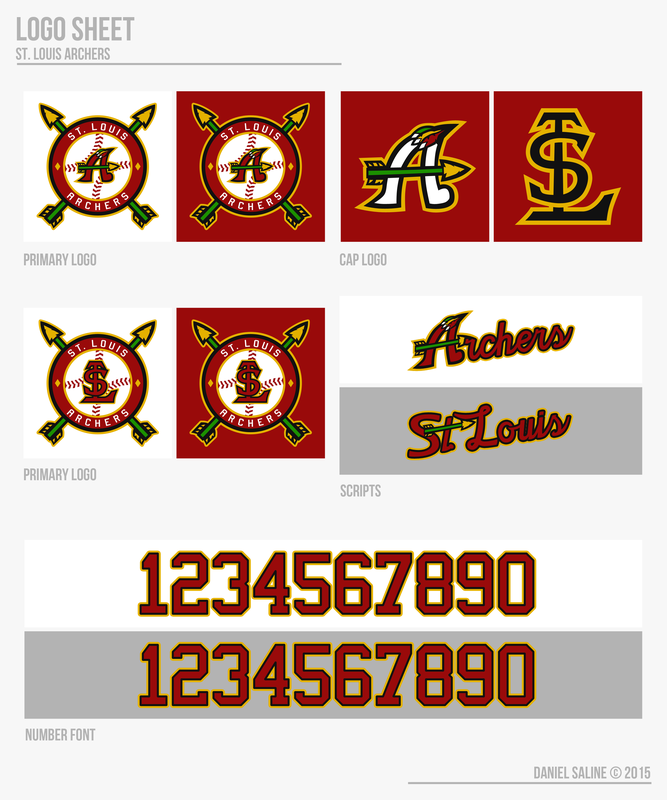 On the home jerseys, the primary containing the STL appears, and the A-Arrow is on the road to balance out the set. The popular yellow alternate is to be worn on day home games, while the gray road alternate is for strictly Sunday road games. The red jersey is worn at the selection of the pitcher, either at home or away. The STL was traditionally on the stirrups, but that was removed in 2010, which many fans wish to see return. 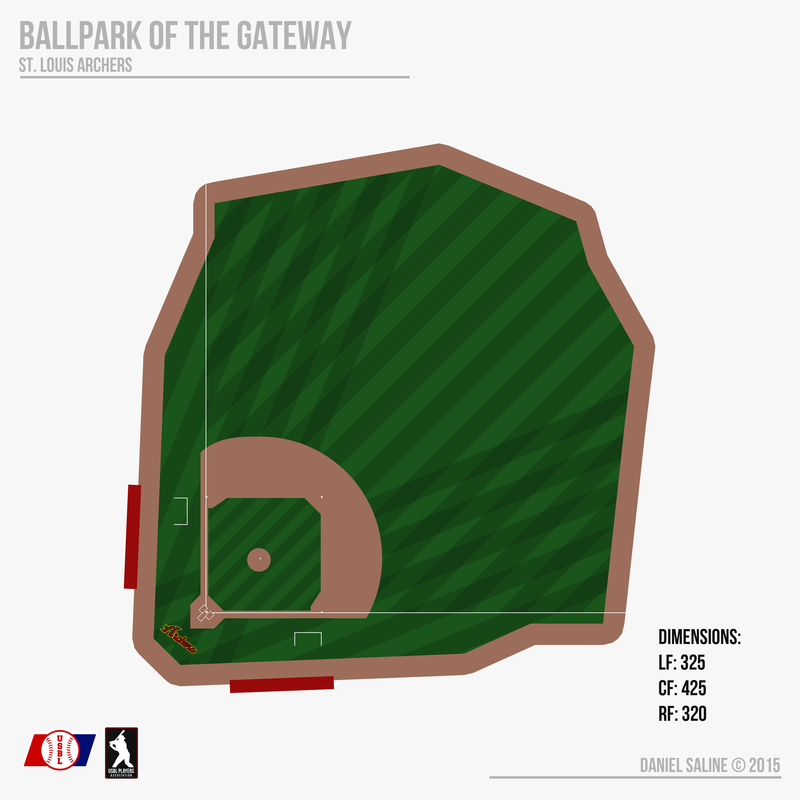 The Ballpark of the Gateway was constructed in time for 1965, leaving the Archers to play road-heavy schedules in their first two years. It underwent significant renovations in the early 2000s, primarily around the concourse. The backstop has been updated several times, but the squared setup was adopted along with the other renovations. BOTG overlooks the Gateway Arch, making it a very underrated stadium in baseball. I see what you did there. Milwaukee Black "Saux". Dsaline is just trolling you guys waiting for Boston. Watch, that'll be team 20. I say ditch the "STL" road hat or change the color of it. The black with yellow outline blends in with the dark red and doesn't look good. If you still want the road cap, I say make the "STL" grey with a yellow outline. Wow, thanks for the high praise, guys! I certainly wouldn't rate it that high, but I'm glad you see it that way. Who knows, but it doesn't look like they'll be 18. 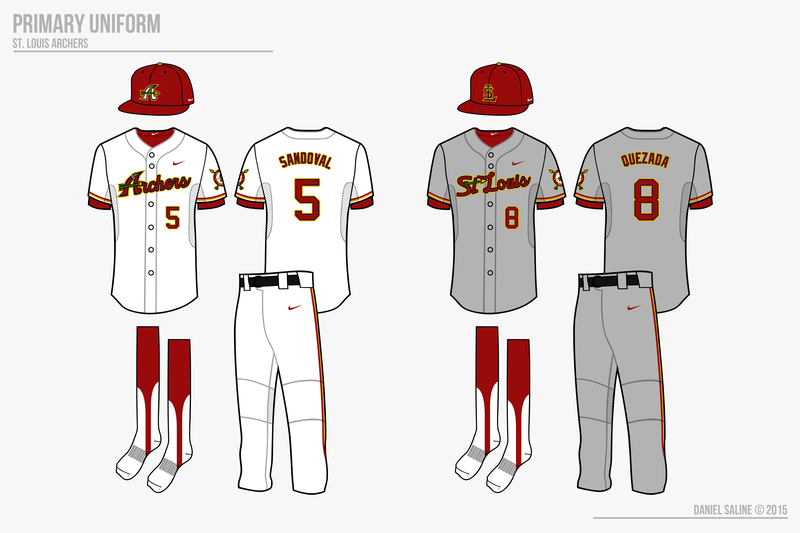 The grey STL would look awful, just like the Mets do. 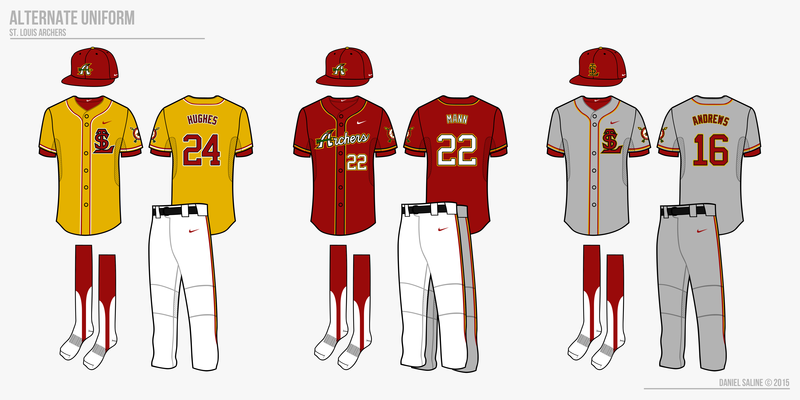 I don't see how it would look any different than the Cardinals, just with different colors. Do you have any plans or ideas to keep this series going once all teams have been revealed? Not happy that Milwaukee doesn't have a team any more, but great job on STL. Any chance you go back and make the Black Saux logo once you're done with all the current teams? I'm pretty sure I responded to you on this, but I may as well start planning for the future. The league is getting a new logo, and there are a few teams that may tweak some things. The Lonestars, Loggers, Sidewinders, and Fire are a few I've considered, but that's not at all set. The USBL will expand to 24 teams in 2016 as well, look for that at some point. Each team has three minor league affiliates, but that's a long shot and won't happen until next summer at least. Milwaukee could get a club in 2016, but that's still up for debate. I wouldn't create it unless it was part of a throwback, and the bridge between St. Louis and Milwaukee was burned to the ground. They're smaller because I wanted the Arrow to grab your attention and be the unique figure, not the feathers. That is a fair point though, hope that helps describe my thinking. I saw the name in the title and honestly thought it was something with the arch in STL, which I wasn't really fond of. But this way exceeded my expectations! Great job. STL looks really nice. Kind of has a Braves vibe with a little Cardinals thrown in. The scripts and overall imagery are really solid. The only thing is that the feathers on the "A" logo would be REALLY hard to reproduce at small sizes. Think about the embroidery on the cap for example. Looking at it again, you and paperthin are probably right. I'll try to work on that today or tomorrow. Thanks for the comments! Here's a side-by-side of what the A would look like with larger feathers, what do you guys think? I'm debating whether to try and fit the feathers into the road script somehow, or would that be too much? The archers set is my favorite of the whole series! I love the feathered A and it looks better with the feathers bigger. The scripts are fantastic as well. Keep up the good work!